Solo: A Star Wars Story has hit theaters, in Lucasfilm’s latest attempt at exploring the man behind the mythos, Han Solo. But it is not the first time the company has deeply explored the beloved smuggler, scoundrel, and hero. It’s done so before, in one of the greatest works of art in our modern times: Kinect Star Wars. For those unaware of this licensing classic, Kinect Star Wars is a truly god awful video game released in 2012 for the Xbox 360, a showcase for Microsoft’s motion-sensing Kinect peripheral. Players could swing lightsabers around (badly), speed off in pod-racers (badly), and, most bizarrely of all, take part in Star Wars-themed dances (also badly) set to real-life pop ditties tweaked to have Star Wars lyrics. 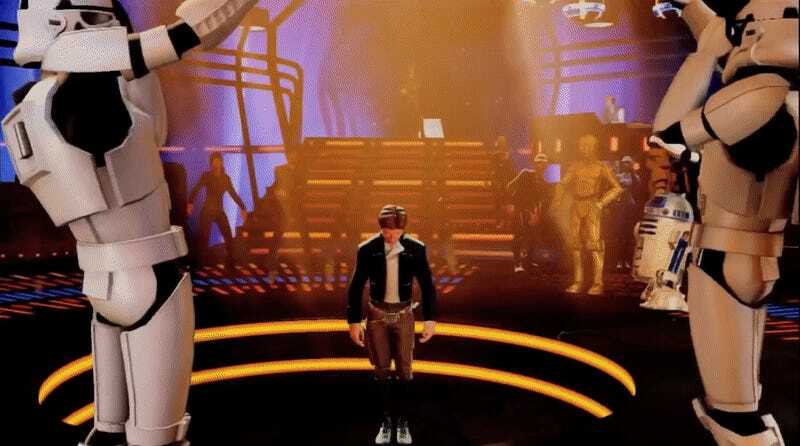 The infamy of “I’m Han Solo” has outlived any other memory of Kinect Star Wars, the embodiment of everything that makes the game a black mark in already pretty dodgy history of Star Wars gaming. It’s meme-power is so potent, this week Select All published an in-depth interview with Kevin Afflack, a music producer on Kinect Star Wars, trying to uncover just how such a bizarre song was made in the first place. But the story of “I’m Han Solo” is so much more than the hows and whys, it’s in the meaning we can derive from its insightful mediations on the psyche of Han himself. And so, to celebrate its depth, I—a man with an actual degree in English Literature—will now offer a literary analysis of this legendary song, a tale of trauma and identity. The duality of man (the duality of Han, if you will) is self-evident in what will become a major refrain in “I’m Han Solo.” Contrast the first four lines of this verse, the elation in Han’s freedom, with the repetition of the last three. What is meant to signify perhaps a level of boastful confidence—he is Solo, the definite article, and wants the audience to know it—is undercut by the need to repeat this seemingly factual statement. But Han is also subtly telling us something else here, in line with his characterization in the films as a man keen to keep his actual feelings close to his chest. He is both Han Solo, and Solo—unique, individual, and yet also, alone, under the mask of his supposed happiness. The first verse plays off the braggadocio of Han’s freedom, as he reassures us that “since that carbonite’s off me” he has the capability to be the things that he believes define him once more—be a ladies’ man, answer to no one but himself, and not hang on the walls of alien gangster’s palaces like a grim art exhibit. Han’s idealized version of freedom here is one of restoration, a return to the man he once was, rather than one changed by his traumatic experience within the carbonite chambers of Bespin. But as with the chorus, Han’s boastful joy in the prior verse is immediately contrasted with a more introspective, emotive follow-up. We have presented to us, at first, the Han that Han wishes to be, that confident suave hero that he has always been, but now we see that underneath that persona is a man who has weathered immense pain and internal conflict—and, you know, being frozen for a bit—and is trying to pick himself back up in the wake of a harrowing experience. The idealized boast of his smuggling life is not a status quo to return to here, but instead a longing dream, a need to be the man he was before his harrowing, life-changing experience at the hands of Darth Vader and Boba Fett.. The mask parallels become more blunt as we head into the chorus refrain again—literally, shades over his eyes, the windows to Han’s roiling soul, covered up and safeguarded. He is jumping in his ride and heading out, away from the introspection of his internal pain, and once again, the repetition of his name once again hammering away at that insecurity and solace. There’s a similar theme in this alternate chorus, too. The doubly repeated second half further accentuates Han’s self-consciousness, but the first four lines once again contrast an exterior, immaterial self that Han seeks to define himself by. His blaster, his ship, his co-pilot—distanced by not even being given his name, but instead just a species, because all that matters is the very image of it in relation to Han’s persona—are all empty accoutrements Han desperately seeks both value and validation from, but can never truly have, if he is truly Han Solo, solo. This third verse strikes a much more different tone. It’s one of reconciliation—instead of yearning to be the man he was, Han instead begins to create a new self for him to inhabit; a responsible member of the Rebel Alliance, a man who not only knows who he is again, but loves who is he again. The repeated “yeahs” here, unlike the repetitions in earlier verses, echo with confidence rather than insecurity. From here, the second verse and the complete chorus is repeated—an understandable piece of structure, but perhaps a cry for reassurance, perhaps even a cry of futility, from our subject. The repeated vocals here act as an echo to the underlying existential turmoil that was merely subtext in their original lines’ context: Is Han Solo truly still Han Solo after all he has gone through during Empire Strikes Back and Return of the Jedi? Most importantly, can he be? Who even is Han Solo, in Han’s eyes—the accessories and the exterior, or the troubled soul within? In conclusion, “I’m Han Solo” is a bad song but now I’ve listened to it approximately 30 times writing this post so I may never get it out of my head.